Easter is coming soon. All Christians have celebrated Easter from remotе past till nowadays. The most popular Easter signs are the colored eggs. I would like to represent you an unique way to surprise your beloved people with handmade present – egg in gold or silver clothes. 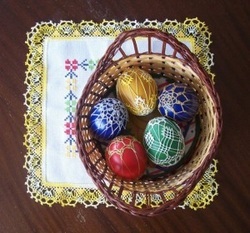 You need colored eggs… silver or gold thread, sewing needle and thin crochet hook. The schemes you can find in every crochet magazine. You need 2 patterns – about 5-7 cm , the same or different. You have to follow just a simple rule: both patterns must have the same number of places for hang. Don't cut the thread of the second pattern – you have to use it for hanging the patterns on the egg. some schemes, which you can use for crochet.